Breakfast and brunch menus continue to expand in scope and creativity. The blurring of dayparts is one reason for this trend. The number of restaurants, colleges, corporate cafeterias and other operations serving breakfast all day is growing—a move that appeals to 54% of consumers who say they enjoy eating breakfast foods at nontraditional times, according to Technomic’s Breakfast Consumer Trend Report. And 22% of consumers are more likely to visit full-service restaurants for brunch than they were two years ago, per Technomic’s Future of FSR Consumer Trend Report. In response, more eateries are adding weekend brunch and others have extended brunch to weekdays. Cheese and other dairy products proliferate on breakfast and brunch menus, enhancing everything from breakfast sandwiches and wraps to breakfast pizzas, omelets and frittatas. Here are three findings from the top and fastest-growing breakfast cheese lists. 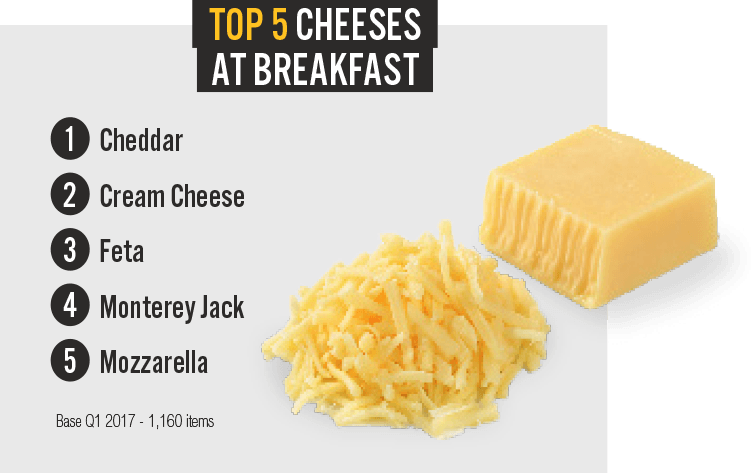 Cheddar still leads by a wide margin as the number-one cheese at breakfast, with some menus calling out specific types such as aged cheddar and white cheddar, a fastest-grower. Three Hispanic cheeses are among the varieties showing the most growth on menus, in step with the uptick in ethnic breakfast dishes. Looking at the example callouts within these lists, many often highlight two or more cheeses in a dish for extra creaminess and depth of flavor. Several trends are triggering the boom in breakfast, while others are bubbling up as a result of its popularity. Let’s look at five trends operators are capitalizing on today. Following McDonald’s lead in 2015, a number of top chains have introduced all-day breakfast, offering sandwiches, bowls and other fare that meet consumer demands from morning to night. And full-service concepts like First Watch, Snooze, an A.M. Eatery and Another Broken Egg Cafe have expanded their breakfast-through-lunch offerings with snack-inspired items. Sandwiches, wraps, breakfast tacos and other portable options are proliferating for the grab-and-go crowd. Many menus offer a balance between more indulgent choices, such as Starbucks’ Bacon, Gouda & Egg Breakfast Sandwich, with healthier options. More than half of millennials (51%) and 43% of Gen Zers would like to see more global items offered for breakfast, per Technomic’s Breakfast Consumer Trend Report. Incorporating Hispanic dairy products like crema and cotija cheese into mainstream breakfast items is a way to ease ethnic flavors onto the menu, as is looking to other cultures for breakfast inspiration. 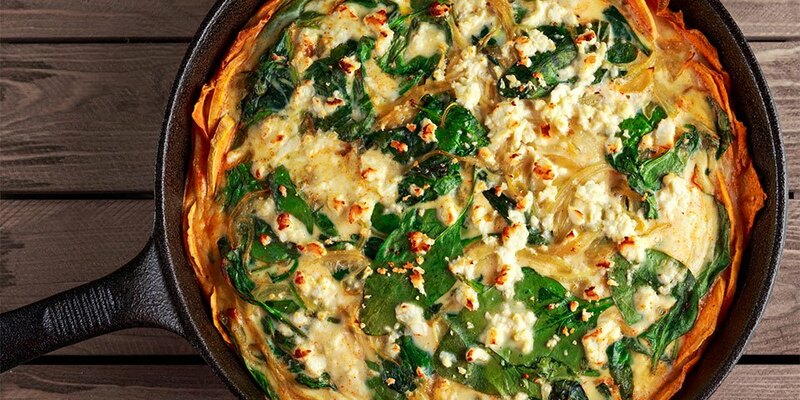 Dishes such as Mexican chilaquiles, Georgian khachapuri (cheese-filled bread) and Colombian arepas are on-trend ideas to explore. Rushed weekday breakfasters might grab a smoothie or yogurt after an early morning workout, then sit down or take out a heartier breakfast later in the morning. Concepts that cater to all-day breakfasters are reaping the benefits of this trend. Hotels are destinations for both business breakfasts and weekend brunch, but some concepts are ditching traditional menus and buffets in favor of passed breakfast appetizers, shareables and build-your-own breakfast bars.